For me, one great memory as as child was heading to the library with my mum and sisters. After checking out the kid’s books and lounging on beanbags, we could choose whatever books took our fancy and take it home to enjoy over and over again. It was like entering a toy store and being told you could choose 5 toys that took your fancy! 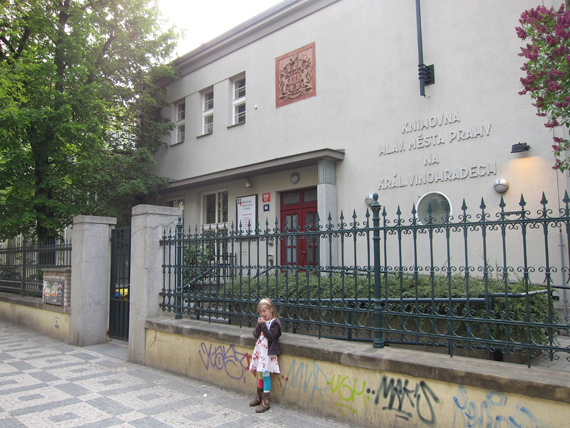 Now, I too can share this with my kids as we have a library card for the City Library of Prague (Městská knihovna v Praze) which house a collection of English books for children in Vinohrady, Dejvice, Ládví and the centre of Prague. 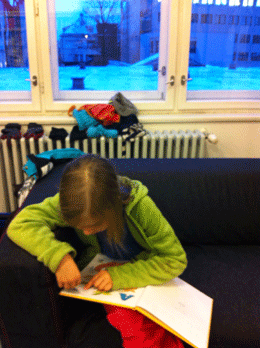 The main collection of English language books for children is held at the Korunni Public Library at Korunni 68. It’s right next to Vinohradska Vodarna (Water Tower) and very close to Jiriho Z Podebrad metro station. This library falls right on the borders of Prague 2, 3 and 10 (it is actually within the Prague 10 district). There are currently 1000 books available to loan but there is soon to be 1500 once the collection is categorised and prepared. This new English language collection was generously donated last year by the expat community of Prague. Class Acts initiated the book drive and the original target was for over 500 books, so the final tally of 1500 was a wonderful result, one that we can all now benefit from. The library itself is a warm, bright and friendly space that is very welcoming. Upstairs is the Children’s library, there is lift access for prams, toilets and even a coffee machine. 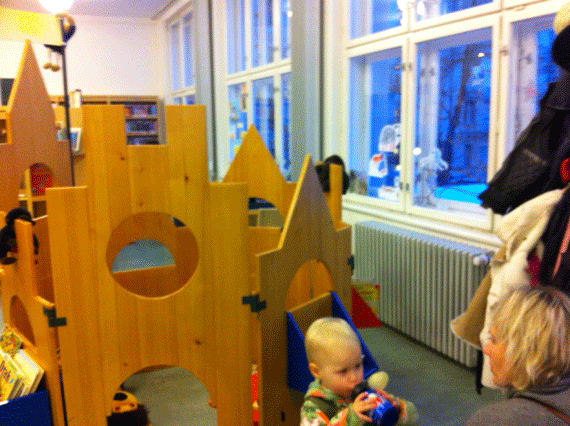 The children’s library has a couch for reading, a wooden castle for play, rocking horse and a few other toys to keep younger ones occupied. Older kids peruse the large range of books in Czech for all ages, on all types of topics, there was even a section for new readers. The same is in the English section - although small in comparison, it has a range of early reader books, poetry, picture books and books for teenagers too. I also noticed a small German section too - I’d estimate around 30 to 50 books. The book drive, subsequent English language collection and monthly storytelling is all part of Storybridge, an exciting new project funded by the U.S. Embassy and developed in partnership with Brno’s Masaryk University to teach creative storytelling techniques to parents and to English language teachers in Czech schools. 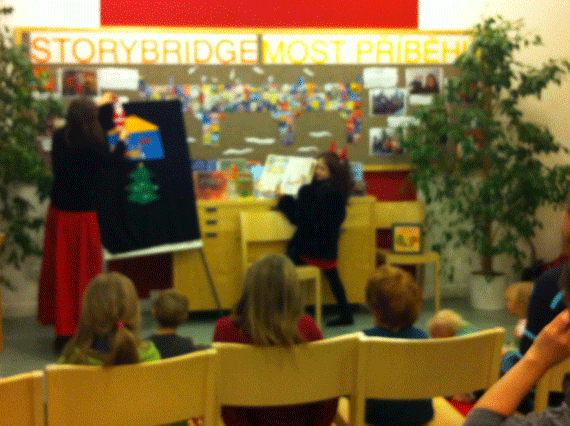 So once a month in conjunction with Class Acts, the library hosts an English Storytelling hour. This is an interactive performance that uses visual elements and physical performance in English to entertain native speakers and those learning to speak English. 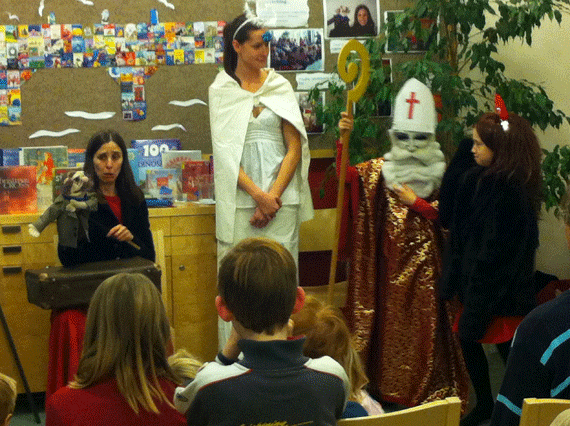 We attended the December Storytelling which had a Mikulas theme - Mikulas was there with his Angel and Devil. Mr Snooze, the well-known English speaking puppet was grilled by Angel - had he been good during the year? 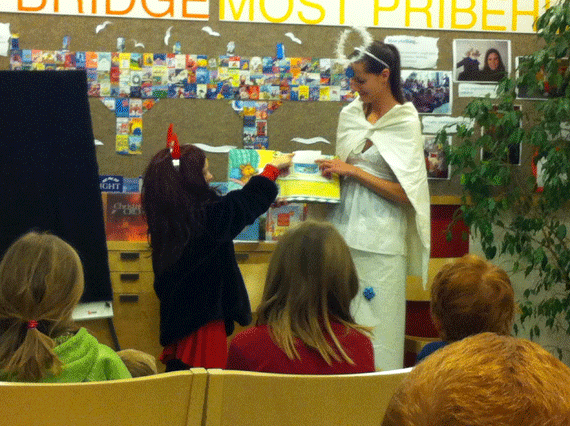 This exchange entertained the children and then led into the first of two book readings, Andel read the book with the help of the Devil changing the page. A felt board was used to place a Christmas tree upon it - children then had to decorate the tree by identifying the shapes and colours of the felt decorations - they were then encouraged to come up and place the shapes on the tree to decorate it. The final story was the famous poem ‘Twas the Night before Christmas’ - once again the felt board was used to demonstrate the story of St Nicholas visiting the house, climbing down the chimney, flying off on his sled - it was very well done and the children’s attention was held throughout the 45 minutes. Storytelling uses books from the English collection and is recommended for children aged 4 to 8 years. If your child is a little younger and has a good attention span then you could give it a go too. This event is free. Also, if your child understands some Czech then you may be interested to know that the library has storytelling every Thursday from 14.30 till 15.15. Wednesday January 16 at 16:00, Wednesday February 20 at 16:00, Wednesday March 20 at 16:00, Wednesday April 17 at 16:00, Wednesday May 15 at 16:00. To join the library speak with the lady who manages the Children’s Library upstairs, she speaks good English and is very helpful with filling out the forms and explaining how the borrowing system works. You will need to fill out a form with your child’s address details, name, date of birth and your email so they can remind you if your books are late. As the parent you will also need to show some id - a resident card or permit showing your address is good. The librarian will then issue your child a card on the spot which they need to sign - only so they identify it as their own so it does not have to be perfect. 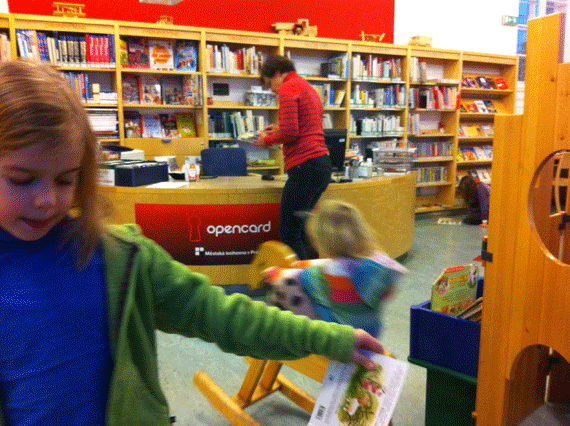 This card then allows them to choose 30 books - yes, that is right 30 at any branch of Městská knihovna v Praze!! The borrowing period is for 1 month but you can extend for a second month on their website which also happens to be in English too! If you do not extend online or keep the books for longer than 2 months then you will need to pay 5czk per book per day over the return date. When your child has selected their books upstairs you need to take the books downstairs along with their card. 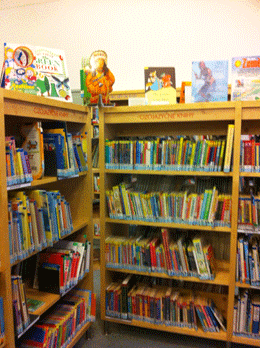 The librarian then scans the books and gives you a print out which lists the books and the return date - simple! So go take a look and reward the kids with a storytelling hour too - all free and good fun - perfect for winter! 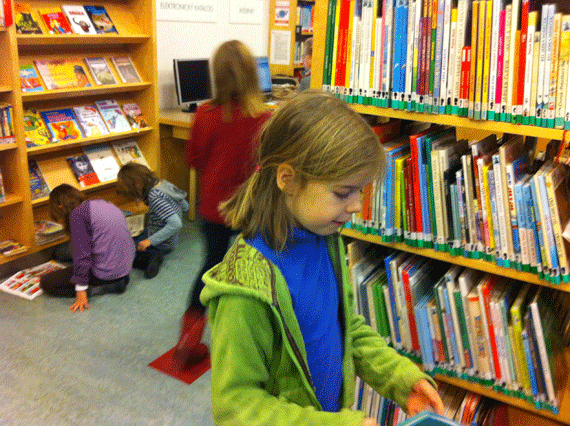 Here are the other MKP locations which house some children’s books in English: Central Library (Ústřední knihovna), Mariánské náměstí 1, Prague 1; Prague National Technical Library (Národní technická knihovna), Technická 6, Prague 6 (Dejvice); Ládví (KD Ládví), Burešova 2, Prague 8. You can find their opening hours listed on the library website below. OPEN: Tuesday, Wednesday, Thursday, Friday: 9.00 to 19.00, Saturday: 9.00 to 15.00. Closed: Mondays & Sundays. ENGLISH STORYTELLING: Once a month, usually on a Wednesday, see schedule above and check Class Act’s website too. DIRECTIONS: By Tram: take trams 10 or 16 to Vinohradska Vodarna - the library is right there or take tram 11 to Jiriho z Podebrad and walk up to Korruni. By Metro: take the A line to Jiriho z Podebrad. By Car: there is some paid parking spots in Korunni.